Nearly every new, rewarding experience has a learning curve, and orthodontic treatment is no different. Whether you’re straightening your smile with Invisalign’s clear aligner system or straightening with traditional metal braces, the process can take a bit of getting used to. Here at Mateer Orthodontics, we understand patient concerns. It is uncommon for a day to go by without a patient cautiously asking if the treatment being considered will be painful. We like to be upfront with our patients and manage their expectations. With that being said, we inform our patients that some initial soreness is completely normal, and at times, as teeth are moving, they may ache a bit. While most of the temporary discomfort a patient may feel is typical, true orthodontic emergencies, while rare, can occur. What constitutes a true orthodontic emergency? If during the course of your treatment, you experience any of these issues, seek help as soon as possible. Start with your orthodontist’s office unless you believe heading to the emergency room is your best option. We totally understand that deciding whether something is ER-worthy or not is difficult. A good example of things that need immediate attention are a fractured tooth, severe unmanageable pain, or serious swelling. Once you’ve attended to the emergency situation, we can adjust your orthodontic treatment plan as needed. The great news is that in many cases, orthodontic problems can be resolved at home. As a general rule of thumb, we recommend trying to treat the pressing issue of discomfort first, and then schedule an appointment with our office. Remember though, even if you can temporarily alleviate some or all of the pain caused by a stray wire or broken bracket, you’ll still need to come see us for a repair appointment. While you’re waiting to be seen, the following guidelines can help you take care of quite a few minor emergencies at home. Many times, “user error” is a normal cause of issues with brackets, bands, or wires. This can be as seemingly “harmless” as eating some hard candy or sticky food, only to realize the situation just went gloriously wrong. Behavior like this can cause you not only pain but also extra time in your braces. If it’s a band or bracket that’s broken and causing you pain but is still attached to the wire, don’t connect any elastics to it; leave it alone until your appointment. However, if it is irritating or scraping the inside of your mouth, cover the offending wire with orthodontic wax. If the piece has broken all the way off, house it somewhere safe and bring it to your next appointment. 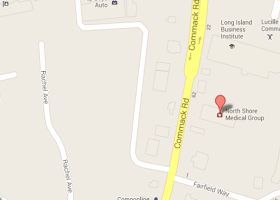 Either way, be sure to give us a call in our Commack office to let us know what’s happened. We’ll be able to recommend what you should do next. Sometimes the archwire can start poking out near the back of the mouth as your teeth start moving into their new positions. This can be irritating to your cheeks. In most instances, you can push the wire into a better position by using a Q-tip or the end of a pencil eraser. If misplaced wires or ties are causing you trouble, they can usually be manipulated back into place with a pair of tweezers. If any wire or brackets are irritating your mouth, cover them with orthodontic wax. And of course, make an appointment to fix the problem as soon as possible. Ask people what a common fear is, and many will answer it’s their teeth falling out. Now, the realization of having a loose tooth in your post-Tooth Fairy years can be scary, but it’s entirely normal for teeth to loosen up a bit when undergoing orthodontic treatment. If anything, it’s proof they are moving in the literal right direction! Sometimes this can be accompanied by tenderness. Using a salt water rinse twice a day can be beneficial and soothing to sore gums. Mix one teaspoon of salt into 8 ounces of warm water, and then swish it around your mouth for about 30 seconds. A warm washcloth or a heating pad on the low setting can also be placed on the outside of your jaw for additional relief. Like anything else, retainers can break. It’s possible for the metal or plastic parts of your retainer or other removable appliance to bend or break, leading to an uncomfortable or improper fit. If this happens, stop wearing your retainer immediately and call the office for an appointment. If your retainer cracks or breaks, keep all the pieces in a plastic bag and bring them with you to your next appointment. We try to repair broken retainers first if we can. While rare, orthodontic emergencies can happen, and we recommend that you seek treatment immediately if one happens to you. That said, we know even non-emergencies can cause stress and discomfort, and our number one goal is to make your orthodontic experience as comfortable and stress-free as possible. We try to be available to our patients as much as possible, so please reach out if an emergency happens. We will do everything we can to correct the problem as quickly and pain-free as possible!